The glass facades allow for a seamless transition from the store to the river and the city. 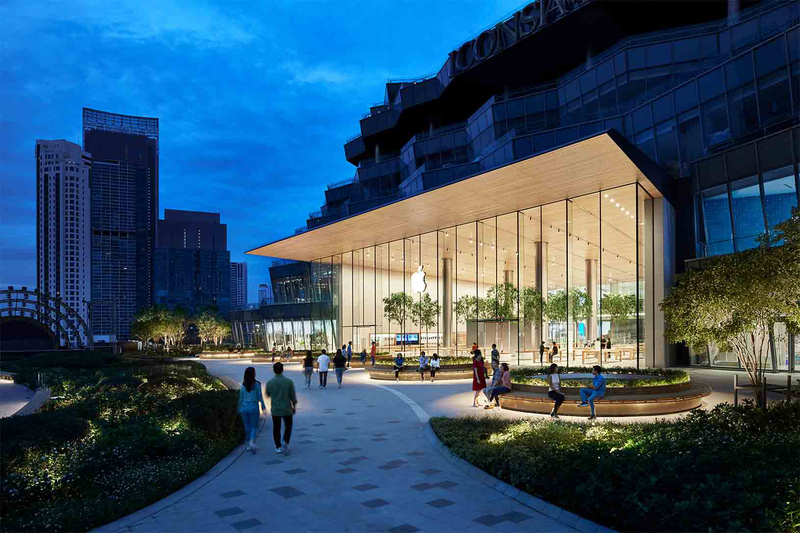 Apple Iconsiam will open in Bangkok on the shores of the Chao Phraya, welcoming both locals and visitors to experience the best of Apple in Thailand for the first time. The store will feature Apple’s full line of products including iPhone XS, iPhone XR and Apple Watch Series 4, and will invite visitors to pursue their creative passions with free Today at Apple sessions. Inside the store, a spacious Forum offers all of Apple’s free Today at Apple sessions, which inspire visitors to connect with one another, discover a new passion or take their skills to the next level. These hands-on sessions, led by Creative Pros, offer tools for all to explore their creative curiosity and learn to make the most of Apple products and services. Along the store’s Avenues, visitors can try out the latest Apple products elegantly displayed for maximum convenience and accessibility. A tree-lined Genius Grove mirrors the flora of the outdoor terrace and provides the setting for Apple’s Geniuses to offer personalized technical support and advice. More than 100 employees are ready to welcome customers on Saturday at 10 a.m. To sign up for Today at Apple sessions, visit apple.com/today.